Macaroons remind me of being little. My Dad and I would have them together after tea and my Mum would scoff at us for eating so soon after our meals. So, to reminisce, I thought I would make my own. And guys, they were lovely! First things first, preheat your oven to 140 (fan assisted) and line two baking trays with rice paper. In a bowl, mix together the icing sugar, ground almonds and sugar. Add the egg whites and almond extract to the dry ingredients. Yes, that simple! Spoon small balls of the mixture onto the paper, a couple of tbsp per ball. You need to leave enough space between them as they'll expand when cooking! Before they go in the oven, top each ball with an almond flake/half and sprinkle some caster sugar over. Pop in the oven and bake for around 25-30 minuets, or until a light golden brown. You want a crunchy outside and a sticky centre for macaroons! Once baked, take them out of the oven and leave to cool on the tray for a little while. Cut or tear the paper around the cookies to separate them. 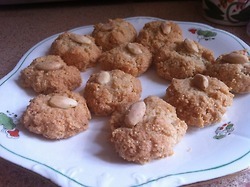 And there you go, lovely almond macaroons. Cannot get enough of these little guys! P.S. Next time I make these I'll do a step by step photo guide so you can see what you're doing - they can be a bit fiddly!